Akiko Kamimura, PhD, MSW, MA. The American Indian/ Alaskan Native (AI/AN) population is considered as an “invisible minority” as their health concerns are not addressed equitably compared to other racial/ ethnic minority populations. AI/AN individuals face high rates of nutritional challenges and chronic health conditions including diabetes and cardiovascular disease. The purpose of this paper is to review concerns about AI/AN health disparities and to propose strategies to reduce disparities. This is achieved by reviewing the evidence for health disparities experienced by AI/AN populations. The U.S. government has been working to improve health disparities for AI/AN individuals, through a number of federally run programs. We propose that one important strategy to reduce health disparities is use a community-based participatory research approach (CBPR). Because of the local input, CBPR is a powerful tool for addressing health disparities experienced by AI/AN populations. We further propose that CPBR should be focused on tribal consultation in policymaking, an increase in AI/AN stakeholders, and health disparities in lifestyle issues for AI/ AN people living in urban areas, in addition to reservations. American Indian/ Alaska Native (AI/AN) refers to individuals having origins in any of the original peoples of North and South America (including Central America) and who maintain tribal affiliation or community attachment . Between five to six million people in the United Sates (US) identify as AI/AN . This racial group comprises two different percentage of the total US population . Twenty-two percent of AI/AN live in reservations that are legal designations for land managed by recognized AI/AN tribes . In 2010, approximately 70 % of AI/AN people lived in urban areas, representing an increase from 38% in 1970 and 60% in 2000 . The AI/AN population can be thought of as an “invisible minority” as their health concerns are not addressed equitably compared to other racial/ ethnic minority populations . While the U.S. government offers urban Indian health programs, which provide healthcare services to AI/AN, only 25% of AI/AN people receive healthcare services through urban Indian health programs . AI/AN people living in urban areas are particularly underserved because: 1) AI/AN individuals in urban areas might have less understanding of traditional practices as relocation to urban areas has disrupted traditional culture, while there are no other structures in place to provide support; and 2) there is an absence of sovereign governing bodies to provide valuable support for identification and safeguarding individual rights to health care access . For these reasons, the awareness of the potentially unique health concerns is important when considering the federal government’s role in tribal consultation planning and implementation. The Department of Health and Human Services (HHS) strives to provide AI/AN populations comprehensive quality care. It is vital that the federal government maintains a relationship with the 567 federally recognized tribes they serve because, in the past, some federal policies have negatively affected health outcomes for indigenous people of the US . For example, in 1890, the federal government disrupted tribal culture by preventing indigenous people from leaving their reservations in the search of food [6,7]. Tribes were forced to rely on food rations provided by the federal government, which consisted of sugar, lard, and other nutritionally problematic foods. AI/AN people used these commodities to create a cultural staple, which is known as “frybread” [8-10]. This relationship is preserved through legally mandated tribal consultation for any policy that affects tribes [9,10]. Frybread is the product of federal government intervention and has negatively impacted health outcomes in tribal communities . Mitigating historical trauma and existing inequality is a key focus of the ongoing relationship between these two sovereign governments. As a result of the troubled history between AI/AN people and the federal government, it is vital that the federal government works to ensure cultural competency. Although the mandated tribal consultation policy for the HHS requires input from tribes, there is no mandate for those recommendations to be implemented . Additionally, the Indian Health Service is understaffed and underfunded, which could easily impact the already inadequate consultation for AI/AN individual’s . In order to ensure that the federal government positively affects tribal communities, it is critical to review how tribal consultation is being improved by including indigenous stakeholders in every part of policy (research, discussion, implementation, and review). 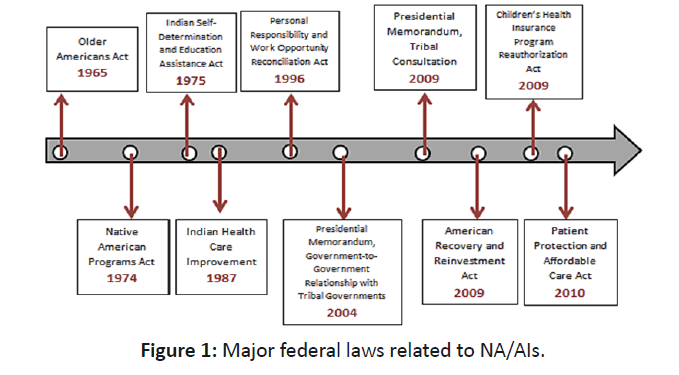 The timeline that provides key legislation and executive orders relevant to the issue of the role of the HHS, tribal consultation and existing policy as documented in the Department of Health and Human Services Tribal Consultation Policy  (Figure 1). The purpose of this paper is to review concerns about AI/AN health disparities and to propose the strategies to reduce the disparities. This review describes a number of health issues including nutritional challenges, chronic health issues, and general health disparities faced by AI/AN people. AI/AN have an average life expectancy of more than five years less than that of the general US population . The health disparities experienced by the AI/AN population are significant enough that their health and mortality patterns are more similar to those in developing nations than to the general United States population . This review paper contributes to the existing data surrounding research of AI/ AN people living on reservations and in urban areas. Due to the potentially shortened duration of life associated with high rates of chronic illnesses, it is imperative to continue analyzing current research and conduct further research surrounding AI/AN people. Additionally, as the US has not historically delegated adequate federal resources to care for tribal communities, it is of the utmost importance to implement health promotion programs associated with the values, and in coordination with the input, of these communities . Figure 1: PRISMA flow diagram identifying steps of inclusions and exclusion of studies. Lack of fertile land for agriculture, coupled with the existence of food deserts, presents a challenging nutritional landscape for AI/AN . Not only the land and available resources nearby impact this population’s ability to make healthy nutritional choices, this community also must straddle the complicated duality between culture and modern knowledge . The disruption of indigenous persons’ relationships with traditional foods and tribal lands can be thought of as being at the heart of health disparities, operating through the mechanism of loss of the high fiber diet and opportunity for physical activity . Poor nutrition has ripple effects throughout the entire tribal community, from type 2 diabetes to obesity to cardiovascular disease. The prevalence of diabetes among AI/AN people is 16%, which is greater than any other racial/ethnic groups such as Blacks (13%), Hispanics (13%), Asian Americans (9%), and Whites (8%) . AI/AN populations have a higher prevalence of diabetes death rates (34.1%) than non-Hispanic white (18.6%) . The prevalence of obesity among AI/AN people (43.7%) is much higher than that among non-Hispanic whites (28.5%) . Likewise, AI/AN people have a higher prevalence of cardiovascular disease among the U.S. populations . AI/ AN adults also have a lower prevalence of engaging in regular leisure-time physical activity (18.9%) than white adults (23.4%). These differences extend to important risk factors for diabetes and cardiovascular disease. Currently, there exist important health disparities in the AI/AN population. Data from U.S. Department of Health and Human Services, Office of Minority Health, which summarizes some key health disparities in chronic conditions (Table 1). Table 1: Obesity, Diabetes & Heart Disease: Age-adjusted health disparities of AI/AN relative to white individuals. Data from the Center for disease control . The federal government has been working to improve health disparities for AI/AN individuals. Congress, in conjunction with the Indian Health Service, established the Special Diabetes Program for Indians (SDPI) in 1997 to provide “funds for diabetes prevention and treatment services” [22,23]. One of the current challenges in type 2 diabetes prevention is the ongoing need for culturally competent techniques, as there is a current disconnect between traditional physiological prevention techniques and techniques informed by consultation with AI/ AN stakeholders . For example, the National Institute of Diabetes and Digestive and Kidney Disease (NIDDK), Diabetes Prevention Program (DPP) research showed that modest weight loss, coming from lifestyle behavior change could prevent the onset and the severity of type 2 diabetes among AI/AN people. These findings do not address the impact of culture on diet and exercise in tribal communities . These analyses reinforce that cultural tailoring is necessary for successful diabetes intervention. A recent effort to interdict in the issue of cardiovascular diseases involves the “Million Hearts” Initiative . The Cardiovascular Risk Reduction Model was developed by Million Hearts as a strategy to assess an approach toward reduction in 10-year predicted risk of atherosclerotic cardiovascular disease (ASCVD) . Cardiovascular preventive strategies to manage the “ABCS” (aspirin therapy in appropriate patients, blood pressure control, cholesterol management, and smoking cessation) have been implemented . This initiative identifies that AI/NA peoples die from heart disease at high rates and young age’s and at rates higher than the rest of the United States population. It is essential to improve health care services for AI/AN people living in urban areas as well are rural areas . Many of the chronic conditions, disproportionately experienced by AI/AN individuals, can be addressed by lifestyle health behavior changes [29,30]. These behavioral changes could be influenced by research conducted in the local context [30,31]. In this way, CBPR is a powerful tool for addressing health disparities experienced by AI/AN populations and can be an important component of tribal consultation . CBPR is a collaborative approach utilizing numerous community partners within the research model [32,33]. Community partners, who can be defined as individuals embedded in the local environment where the research takes place (e.g. an AI/AN health care provider), contribute expertise and share decision making in the research process . The CBPR framework brings together health education, research and social action through mutually beneficial relationships and long-term collaborative commitment . This approach recognizes the value of tribal nations as equal partners who should inform health promotion activities with traditional knowledge rooted in community priorities while local stakeholders are active partners in the health promotion research and interventions . Taking a CBPR approach may also assist in health promotion efforts in rural areas, where the majority of AI/AN people live. One of the issues in integrating CBPR methods in tribal communities is the difficulty in expanding the community capacity to sustain health intervention beyond reservations . This may be due to the lack of research focused on the health of urban-living AI/AN people. For example, less than three percent of the research findings on AI/AN populations include data on urban AI/AN populations . It is necessary to conduct more studies promoting research on and capacity among urban AI/AN communities . While CBPR could be an important next step for improving the lives of AI/AN people living in urban areas, there are three challenge areas that are anticipated as potential obstacles to overcome: 1) underrepresentation of AI/AN stakeholders in key roles; 2) diverse populations within AI/AN; and 3) geographic diversity of tribal nations. AI/AN scholars and policy makers are severely underrepresented in key areas needed to implement CBPR . If the federal government is going to move toward a more community-based approach, there will need to be an increased commitment to identifying, recruiting, and training AI/AN individuals to occupy the key positions needed to appropriately ground this work. Moreover, the diversity among AI/AN populations would add a challenge to implement CBPR. Each AI/AN sub-group needs a different approach toward policy change, as a one size fits all approach to complex issues is insufficient . This rationale is also appropriate for moving tribal consultation to a more community-based health promotion approach. Creating and implementing a communitybased approach to this consultation that honors this diverse set of voices will be a crucial challenge to meet in implementation of CBPR. While there have been efforts to improve health of AI/AN people, health disparities still exist. AI/AN individuals have the highest prevalence of type 2 diabetes, obesity, and cardiovascular disease. AI/AN people have unique cultural needs and history that require culturally appropriate responses. Given the early success of CBPR focused on health concerns such as obesity and diabetes on a reservation, there is a potential that CBPR will contribute to reducing health disparities for AI/AN people living in urban areas. Community-based participatory research approaches hold the potential to uniquely take advantage of current federal efforts at tribal consultation, as well as involving AI/AN stakeholders in research. Tribal consultation and culturally competent, participatory models are essential to ensure that federal-level will improve health outcomes for AI/ AN communities. The disparities in health needs and access points across rural, urban and reservation based communities is something that could benefit from future research. Areas for future research include: interviewing service providers about how CBPR might impact their patient care (especially among AI/AN populations), investigating how CBPR has worked with other racial/ethnic minority populations, and comparing the health outcomes of populations that have been involved in CBPR versus not. Implementing a pilot based approach would be a beneficial step to better understanding the issues specific to these diverse community members. The first author had an internship supported by the Hinckley Institute, University of Utah on the relevant topic and wrote the earlier version of this manuscript as the internship report. Yuan NP, Bartgis J, Demers D (2014) Promoting ethical research with American Indian and Alaska Native people living in urban areas. Am. J. Public Health. 104:2085-2091. Warne D, Frizzell LB (2014) American Indian health policy: Historical trends and contemporary issues. Am. J. Public Health. 104:S263-S267. Sotero M (2006) A conceptual model of historical trauma: Implications for public health practice and research. J Health Dispar Res. 1:93-108. Guarino J (2015) Tribal food sovereignty in the American Southwest. J. Food L. & Pol'y. 11:83. Mihesuah DA (2016) Diabetes in Indian Territory: Revisiting Kelly M. West's Theory of 1940. AICRJ. 40:1-21. Teufel-Shone NI, Jiang LH, Beals J (2015) Demographic characteristics and food choices of participants in the Special Diabetes Program for American Indians Diabetes Prevention Demonstration Project. Ethn Health. 20:327-340. Tripp-Reimer T, Choi E, Kelley LS, Enslein JC (2001) Cultural barriers to care: inverting the problem. Diabetes Spectrum. 14:13-22. Gone JP, Trimble JE (2012) American Indian and Alaska Native mental health: Diverse perspectives on enduring disparities. Annu. Rev. Clin. Psychol. 8:31-160. Devi S (2011) Native American health left out in the cold. Lancet. 377:1481-1482. Hutchinson RN, Shin S (2014) Systematic review of health disparities for cardiovascular diseases and associated factors among American Indian and Alaska Native populations. PLoS One. 9:e80973. Gadhoke P, Christiansen K, Swartz J, Gittelsohn J (2015) “Cause it’s family talking to you”: Children acting as change agents for adult food and physical activity behaviors in American Indian households in the Upper Midwestern United States. Childhood. 22:346-361. Jernigan VBB, Peercy M, Branam D (2015) Beyond health equity: Achieving wellness within American Indian and Alaska Native communities. Am. J. Public Health. 105:S376-S379. Tomaselli GF, Harty M-B, Horton K, Schoeberl M (2011) The American Heart Association and the Million Hearts Initiative. A Presidential Advisory From the American Heart Association. Circulation. 124:1795-1799. Blanchard JW, Petherick JT, Basara H (2015) Stakeholder engagement: A model for tobacco policy planning in Oklahoma Tribal communities. Am J Prev Med. 48:S44-S46. Mendenhall TJ, Seal KL, GreenCrow BA (2012) The family education diabetes series: Improving health in an urban-dwelling American Indian community. Qual Health Res. 22:1524-1534. Drahota AMY, Meza RD, Brikho B (2016) Community academic partnerships: A Systematic review of the state of the literature and recommendations for future research. Milbank Q. 94:163-214. Tapp H, White L, Steuerwald M, Dulin M (2013) Use of community-based participatory research in primary care to improve healthcare outcomes and disparities in care. J Comp Eff Res. 2:405-419. Minkler M, Wallerstein N (2008) Community-based Participatory Research for Health: From Process to Outcomes. 2nd ed. San Francisco: John Wiley & Sons. Dye T (2017) Understanding Public Policy. 15th ed. New York: Pearson Publishing.